Q: FIRST AND FOREMOST, IS THE 2018 HUSKY TE250i BETTER THAN THE 2017 MODEL? A: The 2018 TE250i is the first of its kind. This is a transfer port-injected two-stroke engine. No more need to change out the main jets, needles or pilot jets. There is no carburetor. A throttle body has been put in its place. This bike is very unique but still quite similar to its TC250 two-stroke brother. Since the TE250i is a first-year model, it is significantly better than the 2017 model, because there was no 2017 model. Q: WHY IS MXA TESTING AN OFFROAD BIKE? A: If fuel-injected two-strokes aren’t developed in the coming years, two-strokes could become obsolete. Why? Environmental pressure. Emissions standards in Europe have been getting stricter with each passing year. Euro4 legislation went into effect in 2016 and sidelined the carbureted 125cc two-stroke. The little two-strokes could not pass the emissions test. In 2020, Euro5 legislation will introduce even stricter emissions standards. Those regulations could ban all two-strokes in Europe. KTM engineers saw this coming and, in conjunction with Husqvarna, started developing a fuel-injected two-stroke more than a decade ago. It wasn’t an easy task, and maybe the 2018 TE250i could use a little more R&D time, but Euro5 is like a gun held to the two-stroke’s head. 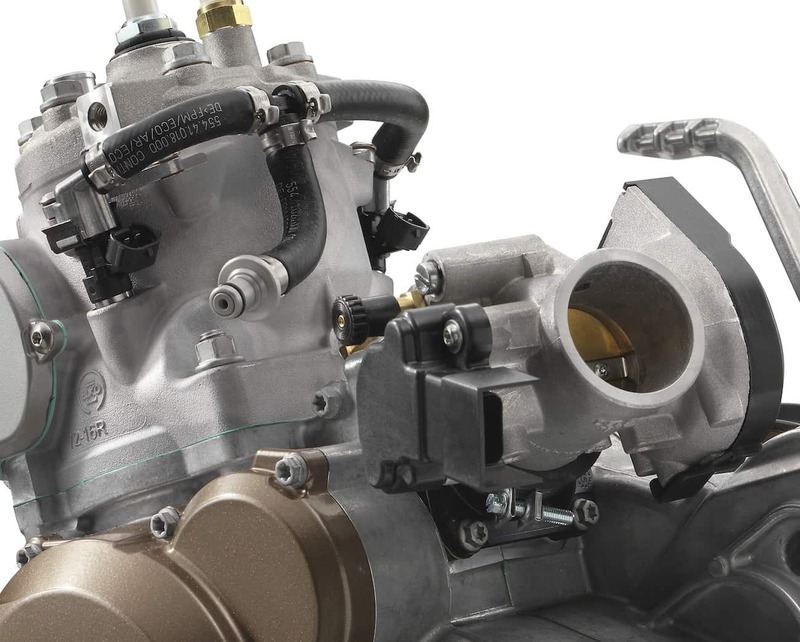 The future of two-strokes will be fuel injection or not at all. We don’t expect the two-stroke faithful to like the added complexity and cost of fuel injection, but they don’t have to. They can keep buying 2006 Yamaha YZ250s until the used bikes are all used up. But, if they want two-strokes to be around beyond the used-bike market, and for their kids, they need to accept that what KTM and Husqvarna are doing is in the best interest of the sport. 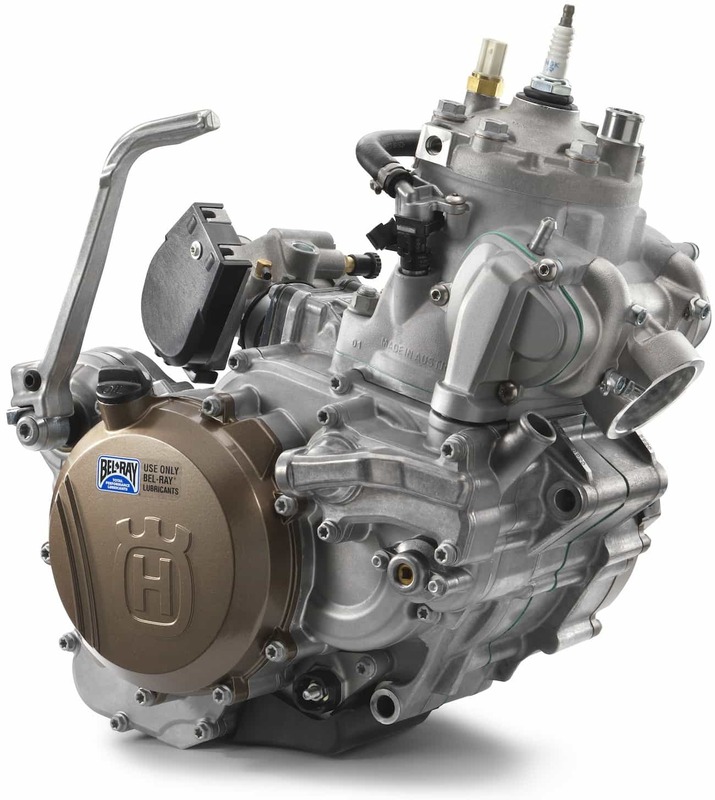 As two-stroke fuel-injection technology progresses, the 2018 Husqvarna TE250i will be a watermark in motorcycle history. 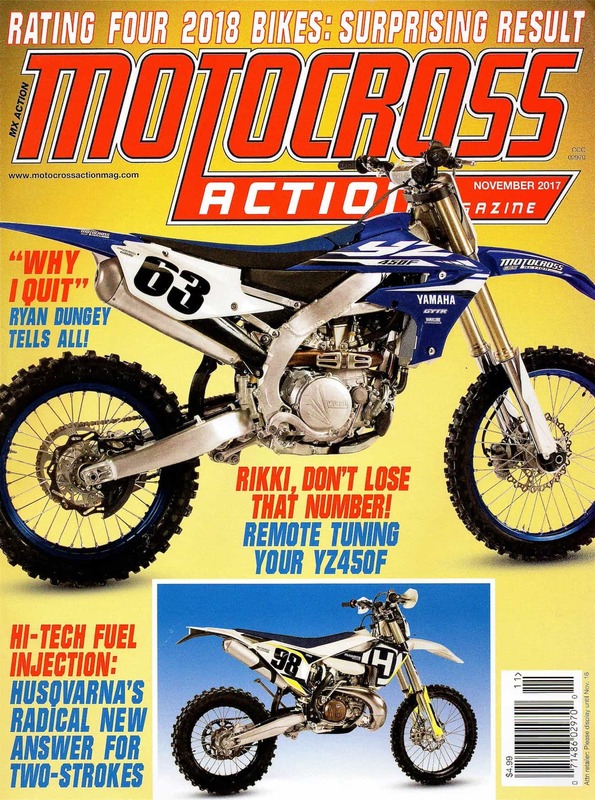 MXA couldn’t ignore this movement, even if it meant testing an offroad bike, headlight and all. What is a motocross magazine doing testing an offroad machine? Looking into the future. To survive, two-strokes must be fuel-injected in the future. Q: HOW WAS THE TE250i ENGINE CREATED? A: Husky was smart. Its engineers designed the 2017 TE250 knowing that a fuel-injected model would have to be inserted into their model line. Making as many parts interchangeable with the TE and TC250 would be the most cost-effective way to transition to the Throttle Port Injected (TPI) model. That is why the TE250i looks very similar to the 2018 TE250 carb version. There are many stand-alone qualities about this bike, though. Here is a quick list. (1) EMS. EMS stands for Engine Management System. This is the brain of the bike. Think of it as the Einstein of ECUs. Husky estimates 70 percent of the data that was collected over the decade-long R&D period is in this black box. It was designed by Synerject, a company owned by Continental tires, and it controls everything in the engine. The EMS has a super-fast processor that allows it to detect the change of each cycle of the two-stroke engine. The biggest benefit of the EMS is the simple-system buildup. For the customer, this means that there is automatic temperature and altitude compensation built in. You never have to jet the TE250i. There are six sensors that collect data for the EMS, which is the same number as in an FC450 four-stroke engine. All this data is converted into signals to control the ignition, fuel injection, oil pump and radiator fan. The six sensors are as follows: Roll-over sensor (this sensor recognizes when the bike is laid on the ground in a crash and shuts off the engine within 5 to 10 seconds). Crankcase pressure sensor (this functions much like a map sensor on a four-stroke). Engine-speed sensor. Throttle-position sensor. Coolant-temperature sensor. Intake-air temperature sensor. (2) Cylinder. The TE250i cylinder has a lot of the same architecture and dimensions as the TC250 motocross cylinder. Externally, the two lateral fuel-injector nozzles, which inject fuel into the transfer ports, were the easy parts of the design. The hard work was done internally. Instead of using expensive prototypes, computational fluid dynamics were used to optimize intake port shape, spray targeting, combustion-chamber shape and much more. Computational fluid dynamics use applied mathematics, physics and computational software to visualize how gas or liquid flows. This allows the engineers to run multiple test scenarios on the computer before actually having to cast a cylinder. (3) Generator. To supply the EMS with enough power, a stronger generator was needed to support both the EMS and electric starter. They used the electrical parts from their four-stroke generator with a few added tweaks. The generator is rated at 196 watts. Also brought over from the four-stoke was the regulator, which is needed to convert AC current to DC current. (4) Throttle body. The TE250i throttle body is made by Dell’Orto. It should be noted that no fuel is fed to the throttle body on a fuel-injected two-stroke. It is solely there to meter the airflow. A twin cable-throttle assembly is used just as on the four-strokes. A throttle-position sensor on the throttle body allows the EMS to know how much air is being delivered at all times. It also features a cold-start knob, idle-adjustment screw and a connection to the oil supply for the separate lubrication. (5) Oil system. No need to premix gas with oil. The gas goes in one way and the oil another. A 700cc oil tank is mounted under the gas tank. A filler cap is located between the fuel tank and steerer tube. It allows the owner to fill the oil tank via a flexible tube that runs inside the frame’s backbone and into the oil tank. The mixing ratio of gas and oil is surprisingly lean and runs between 70:1 to 100:1 depending on throttle position and engine rpm. You will be able to use from four to eight tanks of gas before you will have to refill the 700cc tank. If you are running low, an idiot light comes on to warn you. (6) Gas tank. To make room for the oil tank, the translucent gas tank had to be shortened slightly. The fuel capacity was only lessened by 0.2 gallons over the carbureted TE250 version. No worries. The fuel consumption of the fuel-injected bike is 30 percent more efficient than on the carbureted version. (7) Fuel pump. The fuel pump is exactly the same as Husqvarna’s four-stroke pump. We rode the TE250i on motocross tracks, endurocross tracks, tight trails and wide-open offroad sections. It did it all well. Q: IS THE POWER IN THE BALLPARK OF A CARBURETED MODEL? A: The TE250i has more peak horsepower power than the Yamaha YZ250 and is only 0.2 ponies off the TC250 at 47.28 horsepower. Pretty remarkable, right? 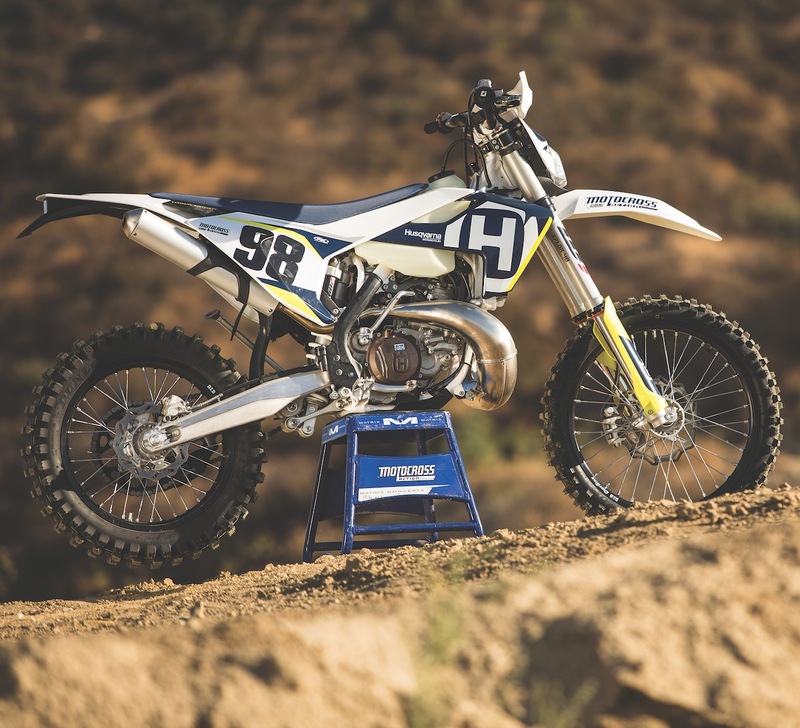 Don’t get too excited, though, because it does give up about 3-1/2 foot-pounds of torque and 5 horsepower at 7000 to 7500 rpm to the TC250 motocross version. The TE250i does pull on top for an extra 600 rpm over the TC250. Sign-off is at 8800 rpm. The TE250i’s powerband is extremely linear. This is mainly due to the heavier enduro flywheel weight. While the TE250i gives up power on the dyno, on the track, the power feels about right for an offroad bike, except for low-end throttle response. All in all, we were impressed with the TE250i’s power output. The TE250i pumps out a smooth 47 peak horsepower. That puts it on par with the YZ250 and KTM 250SX—although the heavy flywheel does give up significant power from low to mid. And the mapping from low to mid was sluggish (which Husky says will be fixed). Q: HOW DOES THE FUEL-INJECTED ENGINE DIFFER FROM THE CARBURETED ENGINE? A: The power is connected at the wrist. There is no lag. The powerband of the TE250i initially had an electric feel. It almost felt fake. The power built slowly and then hit the afterburners when you thought it was time to shift. This was disconcerting. For offroad riding, the TE250i’s top-end power was rarely utilized. On high-speed tracks or long, fast hills you could use the power, but it was not user-friendly. Every MXA test rider felt that the TE250i had serious potential. The power was there; it was just in the wrong spot. Our prime objective was to move the power to where we could get the most use out of it. This is what we did. (1) Gearing. One way to get the feeling of more bottom-to-mid power is to lower the gearing. Stock gearing is 13/49 on the TE250i. We first tried a 50-tooth rear sprocket. This got us headed in the right direction. 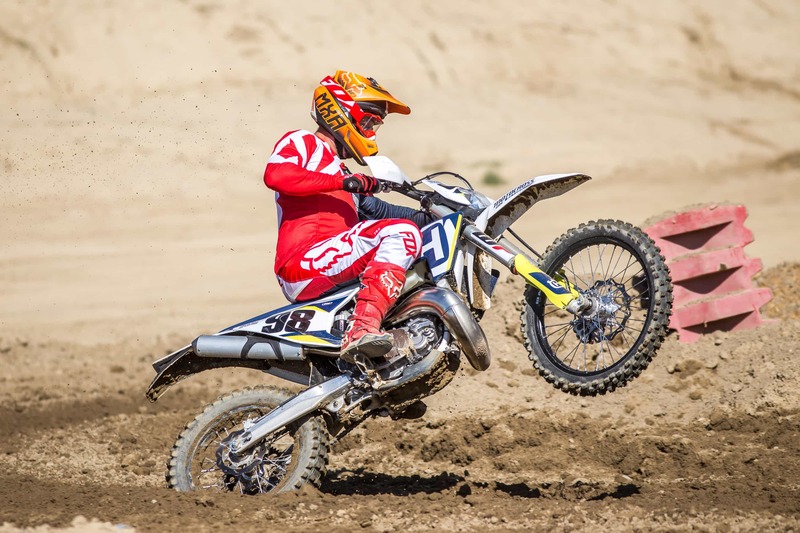 Since first gear is way too low to use in most cases, especially on a motocross track, we had to rely on the taller second gear most of the time. If you carried good speed through the corners, the 50-tooth rear was enough, but in tighter corners, the clutch had to be abused. Going to a 51-tooth sprocket did the trick. It allowed us to get into the meat of second gear quicker and catch third in the meat of the rpm range. Every test rider got good usage out of the fourth gear with some fifth gear on long offroad sections, but most test riders didn’t realize that there was a sixth gear (it was way up there). (2) Power valve. By fine-tuning the power-valve adjuster, you can manipulate when the power-valve flapper opens. The longer it is closed, the harder the power will hit, although top end and over-rev will diminish. The stock setting of the TE250i’s power valve is one turn in from all the way out. Just a quarter-turn makes a big difference. Although we understood that big moves needed to be made to get the power where it needed to be, we wanted to work our way through the options. Initially, we went a full turn in. That would be two turns in from all the way out. It made a huge difference in the way the power was delivered. It brought the meat of the power down significantly. At this setting, it pulled better in soft turns and tight ruts. Since we still had more than enough usable top-end power, we went another half turn in on the adjuster. This turned out to be as far as we could go in without losing top end and over-rev. For MXA, 2-1/2 turns in from all the way out was the sweet spot, especially for a motocross track. In tight offroad terrain, you could go to three turns or more to gain more off the bottom. (3) Airbox. Husky’s signature closed-off airbox restricts airflow. Drilling holes in the airbox gave us more bottom-to-midrange power; however, the bike started to run on the lean side. The TE250i silencer is long. By using a shorter silencer we could have gotten more of the mid-range power we were looking for. Q: CAN YOU ADJUST THE MAPPING? A: There is a two-position map switch on the right side of the handlebar. Map 1 is the stock map, and map 2 is the soft map. Map 2 was useless. With this map, the TE250i ran horribly. It popped and bogged every step of the way. Map 1 was our only option. How did the TE250i fare on a motocross track? Better than any of our test riders could have imagined. It handled well, had decent power and cleared all the obstacles we threw in its path. Q: HOW DID THE OFFROAD WP XPLOR FORKS WORK ON A MOTOCROSS TRACK? A: To be honest, when we went from offroad terrain to the track, we went all in on the compression clickers, as we knew the off-road forks would be too soft for big jumps. Our testers were in for a surprise. Down rough straights and through braking bumps at speed, these forks felt like a Cadillac limo. We didn’t even feel the bumps. Every MXA test rider absolutely loved the Xplor forks—as long as they were on the ground. 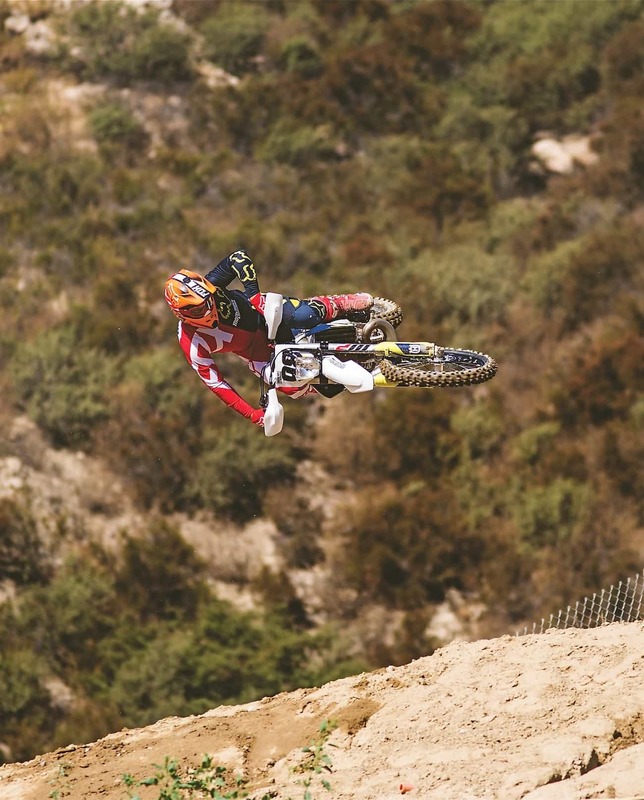 Amazingly, the MXA test riders managed to jump every big jump on SoCal’s tracks on this bike. As long as we didn’t go long or come up short, we could live with the forks. What didn’t the forks like? Tight rhythm sections with consecutive jumps confused the forks. This is where we suffered metal-to-metal bottoming. In truth, we didn’t expect the Xplor forks to work on any motocross track. To find that we could race them on most tracks was a big surprise. No more mixing gas. A separate 700cc oil tank is mounted underneath the gas tank. (1) Maps. Map 2 was horrible. Giving consumers a map that doesn’t work but claiming that the bike comes with two maps is false advertising. (2) Oil light. There is a light behind the front number plate/headlight that lights up when the 700cc oil tank is running low on injector oil. It’s a nice touch, since the plastic oil tank isn’t easy to see; however, our oil-light wiring plug fell out when we hit big jumps. We know this is an offroad bike, and maybe it won’t be jumping big doubles, but if the wire falls out, the light won’t come on and there goes your engine. (3) Oil tank. It is really hard to tell how low or high the level of the oil is in the tank. We don’t want to depend on an idiot light when most of the time we want to know if it’s got a quarter tank, half tank or full tank. These are things that the oil warning light doesn’t tell you. (4) Gearing. The bike needs to be geared down to help out with the lack of bottom-end power. We went from a 49 to a 51. (5) Powerband. The meat of the power is in the upper stratosphere of the rpm range. It is a waiting game for it to arrive, and when the afterburners do kick in, you’re already in the next corner. The low-end throttle response is boggy feeling and every test rider had to work hard to keep the power above it. (6) Availablility. Not very many TE25i’s are going to make it to America in 2018. This bike was developed to meet European emission standards and, thus, the vast majority of the production run will stay in Europe. (1) Forks. These forks absorb chop like it’s not even there. (2) Engine. We can’t believe they cranked 47 horsepower out of a fuel-injected two-stroke the first year running. (3) Brakes. Best in the business. (4) Gas tank. It is pretty awesome that we don’t have to mix gas anymore. (5) Rear fender grip. The offroad rear handle grip on the rear fender offers a good handhold for putting the bike on and off its stand. (6) Package. It is impressive how well this bike is packaged. (7) Jetting. With the help of the EMS system, we were able to ride from 1500 feet elevation to 9000 feet elevation without any jetting problems—no more changing jets every time we go to different tracks. Goodbye carburetor and hello throttle body. No fuel flows through the Del’Orto throttle body on the smoker—only air. Q: WHAT DO WE REALLY THINK OF THE 2018 HUSQVARNA TE250i? A: We thought the fuel-injected bikes were going to be sluggish and heavy. We weren’t completely wrong on those counts, but we are still impressed with the 2018 Husqvarna TE250i. If it’s this good in its first year of limited production, we are excited for what’s to come when they iron out the bugs. This bike may not be perfect, but it is critical for the life of two-strokes. If KTM and Husqvarna can’t sell two-stroke offroad bikes in Europe because of emission standards, they will lose a large percentage of their sales—maybe not to the point where it won’t be feasible for them to make two-strokes in the future, but it will certainly put a damper on their current enthusiasm. We want them to stay enthused. 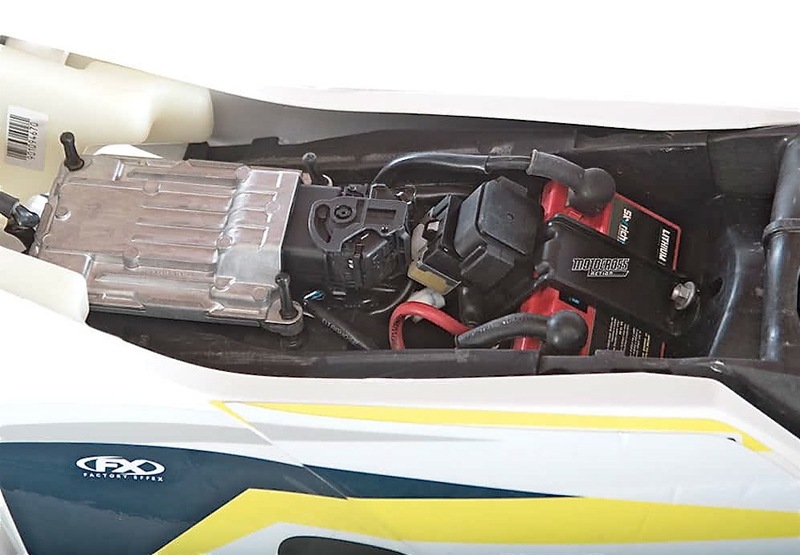 This is how we set up our 2018 Husqvarna TC250i for racing. We offer it as a guide to help you find your own sweet spot. Notes: If you want to use these forks strictly on a motocross track, you might want to add some oil to stiffen up the bottom of the stroke. The Xplor 48mm forks on the TE250i were impressive. They worked well in every condition we threw at them. Even jumps. We felt the WP shock worked well. Stock settings were solid for offroad terrain. 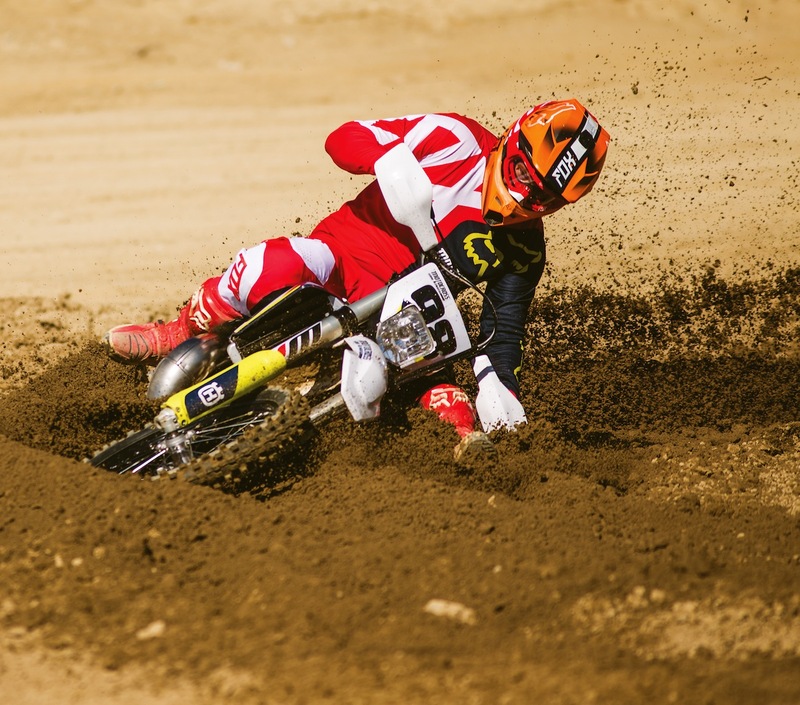 For motocross, we went all the way stiff on the compression as well. Considering the soft damping, it still held up well on hard landings and absorbed chop without any issues. Had you subscribed to MXA, you would have read this complete bike test when in came out back in October. Click the box below to subscribe.